Best Image Import Workflow Ever! Cameras are truly amazing things, they have the ability to capture time forever! In the old days, it was stored on film but since the digital revolution, it’s stored in bits and bytes, zillions upon zillions of 1s and 0s. RAW is the format that can capture almost as much information as film. RAW is exactly what the camera sees and saves when you push your shutter button on your camera. The files are enormous but they give you the most options in the universe for editing. JPEG locks you into a specific format that still looks great, takes up way less space but is limited. Enter my new workflow revelation. Shooting RAW+JPEG! I have come to believe this is THE way to go. You always have the RAW file to work with, but you also have smaller JPEGs that process quicker, look great out of the camera, and take up way less hard drive space. I set my camera to take RAW and Medium sized JPEGS with Fine compression giving me a file size that is 3216 × 2136 (6.9 MP) which works out to ±3megabytes. It’s time to be realistic. Hardly ever do you print photos bigger than 8×10. And you can print that from an 1800x1200px image. So why do you need anything bigger? A JPEG image that is 3216 × 2136 is plenty sufficient. And, if you make a great photo you want to blow up to 20×30 or 40×60, you’ve got the RAW file to do that from. And here in lies my new “Best Workflow Ever” procedure. I’ll be totally honest, I came across this concept first in a Photoflex episode (80:7, 2010) by Gary Box. He’s a professional photographer based out of Oklahoma. He shoots RAW (as everyone should) then generates 1500px JPEGS from which to edit for his clients. The computing power needed to edit small JPEGS is minimal in contrast to RAW editing, supercharging the editing workflow to notches unknown to mankind. Everything is quicker with JPEG than it is with RAW. It allows him to fully edit a photo in about 60 seconds, which is mighty quick. The second advantage is in the importing process. When you import your images into Aperture or Lightroom, importing a few thousand small JPEGS takes no time at all. It’s fast! The processing is über quick too. But you still want the RAW files incase you get a hot photo you want to blow up. And herein lies the best part. You can import only the RAW files you want in a simple two step process. I use Aperture 3 and it makes this super easy. I’m sure you can do it with Lightroom too though. The first thing is import your medium size, fine compression JPEGs (JPEG files only). Go through them, making your selections (stars, flags, colors) of good/keeper images. Some of the images will be complete junk (blurry, exposed wrong, test shots, etc.) – you know you don’t wanna blow hard drive space with RAW files of that crap. Even if you are diligent and delete them all later, you still have to import them all and sift through them. With smaller JPEGS, you can keep all the crap you want at a far less hdd space & time cost! Then, once you’ve got your basic “gooder” selections done, you go back to the import dialogue and import the RAW files that match your selections. This way you only keep the RAW files for the best of your photos. You’ve got the full options if you ever want to make a big print later. 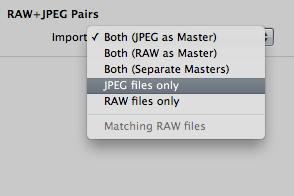 Both the RAW and JPEGs import as matched pairs and you can access which ever file you want by right clicking on it and choosing either RAW or JPEG as master. 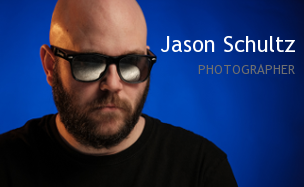 This entry was posted on December 16, 2011 by schultzphotographic. It was filed under Aperture 3, Photo Editing and was tagged with Aperture 3, Digital Photo Editing, Importing, Photography, RAW+JPEG Pairs, Workflow.